The Church of England is composed of two provinces: The Archbishop of Canterbury leads the Southern Province while the Archbishop of York leads the Northern Province. Together, they extend across England, the Channel Islands, the Isle of Man, the Isles of Scilly, and a small part of Wales. The archbishops, bishops, priests and representatives of the laity meet at least twice a year in General Synods to consider church business and establish policy. 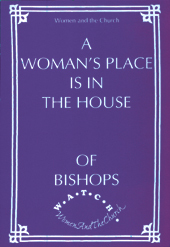 The General Synod of the Church of England voted in favor of the ordination of women priests in 1992. The first group of 1,000 women were ordained in 1994. The next logical step was for women, religious liberals, human rights supporters and other opponents of sexism within the church to press for consecration of women as bishops. 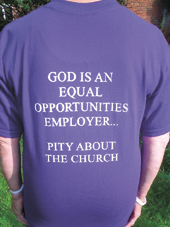 The official state church practices discrimination against all women, without regard for their talent, ability, education, dedication, or experience. The logjam was broken in 2014-JUL when, under threat from Parliament, the laity members of the General Synod overwhelmingly approved female bishops by a vote of 152 in favor and 45 opposed. Sexism in the Church of England is expected to come to a granding halt in mid-2015 with the consecration of the first female Church of England priests as bishops. tea towels, T-shirts, and other merchandise. See our news feed on women's issues. It shows 20 current news items, and is updated every 15 minutes.